For the last few years- the Clarisonic has been on my wish list for Christmas. I had heard amazing things about the past models and having never spent a lot of effort on my skin, I wanted to see what it could do for me. Obviously Santa never delivered, but this year I've taken the matter into my own hands. 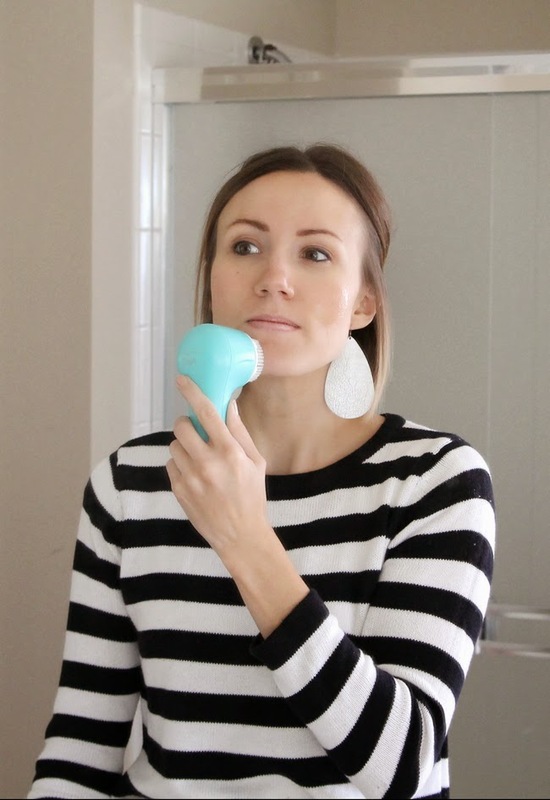 When offered the chance to review the Clarisonic Mia 2 I jumped and of course I wanted to pass on my opinions as you make your Christmas list this year. 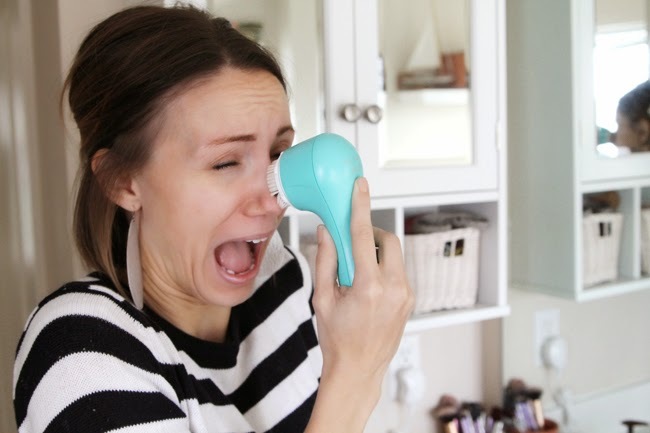 If you've never tried a facial cleaning device, I've got a quick little tutorial for you- with pictures! 1. 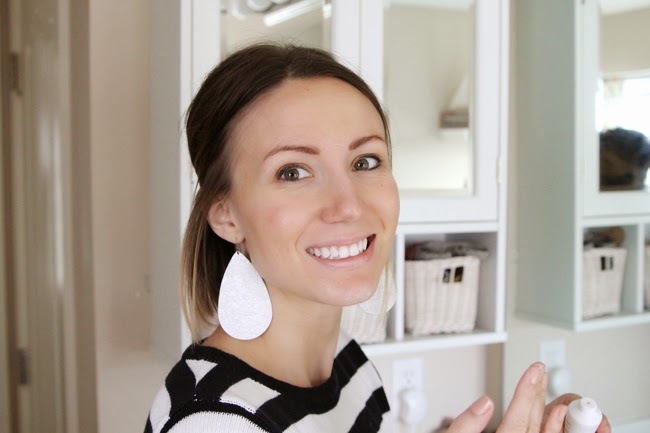 First wet your face with warm water and apply the cleansing gel that comes in the Clarisonic kit. It only comes with a small tube and a full size tube will set you back $25 when you need a refill. I like the Clarisonic gel, but I may try other cleaners with it as well before I replenish my tube. I used about a dime size of gel and just applied it evenly to my face. 2. The electric face brush has two speed settings and for the first few times I used it I kept it on the lower speed. When you begin, you start on your forehead and move the brush in small circles for twenty seconds. The brush doesn't scrub or spin, it kind of vibrates and it feels really good. After twenty seconds the vibrations will pause signalling you to move to your nose and chin for the next twenty seconds. This is when it feels crazy! On my first try I almost couldn't handle it on my nose because it was vibrating it so much. It tickled and felt so crazy! Clearly my picture illustrates that. But after that initial shock I backed off a bit and its felt fine. Just beware that it tickles! 3. The vibrations will pause again and you then have ten seconds to do one cheek and ten to do the other. And that is it! 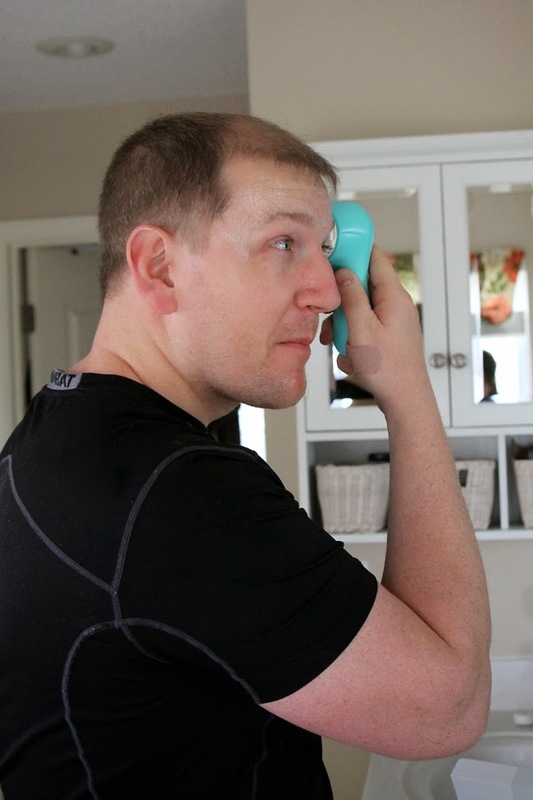 I had a few partners in crime while testing out this lovely beauty product- a messy faced baby and my camera man hubby. 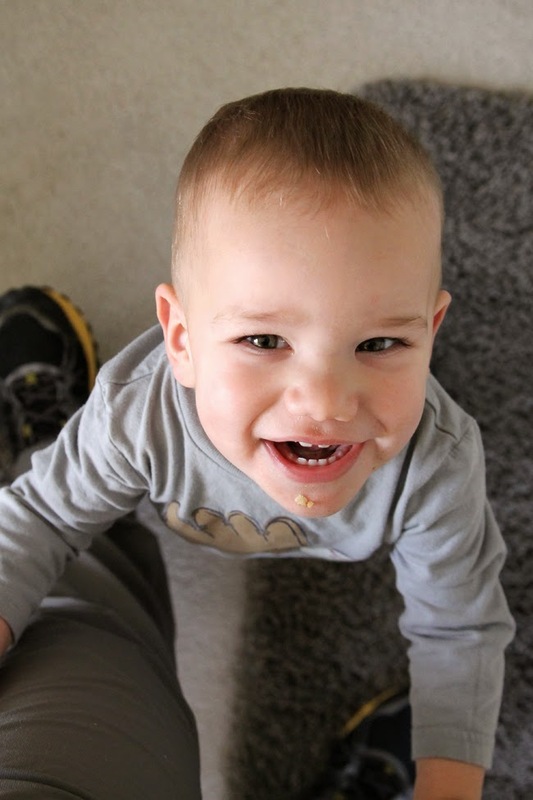 After we took my photos while testing, Soren decided he wanted a turn. He lathered up and scrubbed away too. And our opinion? We loved it. Of course we did.The Clarisonic definitely delivers a clean and soft face. I've been using it about three times a week and my complexion really does look and feel better. And given the many, many nights that I go to bed without removing my makeup or most days that I don't drink enough water- I can use all of the help that I can get. This is definitely a great product to add to your Christmas list and your beauty routine this year. They aren't kidding when they claim it cleans 6x better than typical face washing with your hands. I love how it has helped my skin and you know this is as close to a facial as I'll be getting in the near future. I think Soren put it best when he said his face felt like it had been to the dentist- in the best way possible. You know that fresh, super clean, crisp feeling your mouth has when you leave a teeth cleaning? That is what your skin feels like after a sonic cleaning from a Clarisonic. 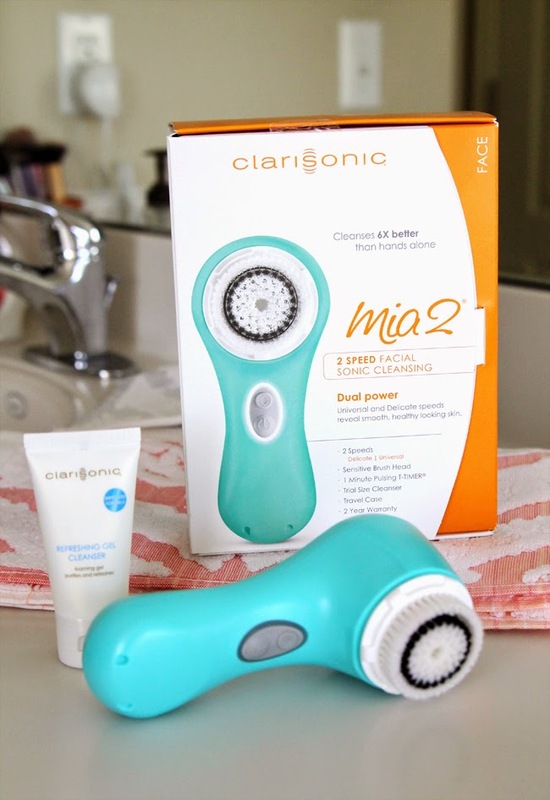 Have you tried the Clarisonic Mia 2? Will it be on your list this year? I have one, too. I love it! My face feels so smooth and soft. Just purchased one when Sephora had their 20% off sale! I'm excited to try it out this weekend. I've been told to use the path of cream cleansers with the Clarisonic rather than a gel ~ especially during the winter months. Love your review (and blog page, too)!